$7.00 per invitation suite for a set of 100 invitations, fully assembled. 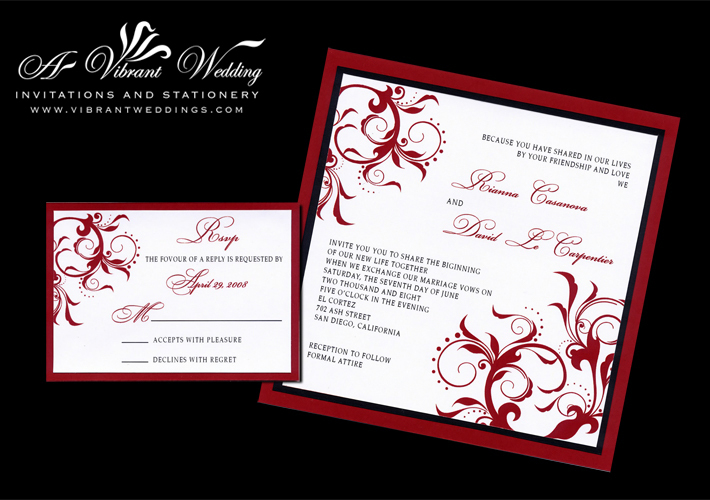 7×7″ Wedding Invitation with Floral Scroll printed design, triple-layered (3 sheet of card-stock paper glued together), a 3.5×5″ Double-matted Response card, and two blank matte envelopes (White). 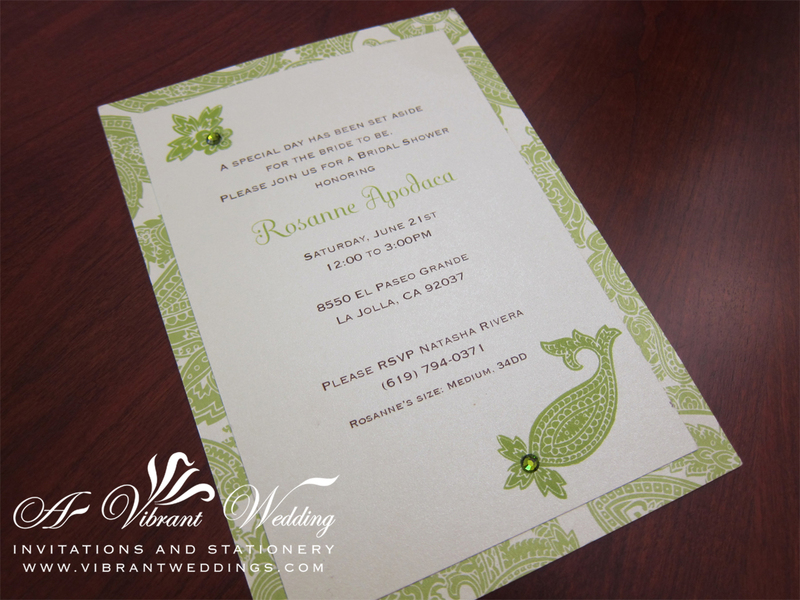 Try this same printed design as a 5×7″ flat style invitation for a less expensive alternative. 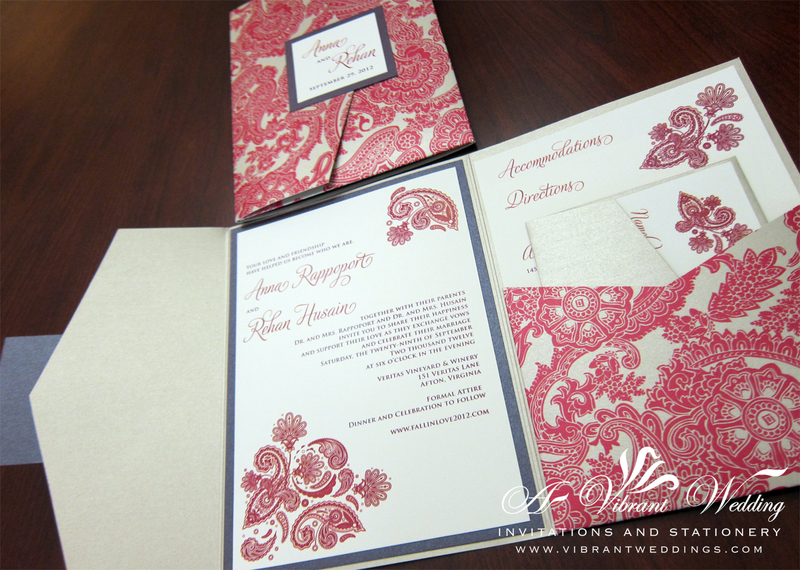 A Red Paisley and Ruby inspired Indian custom wedding invitation. 5×7″ Pocket-fold style. 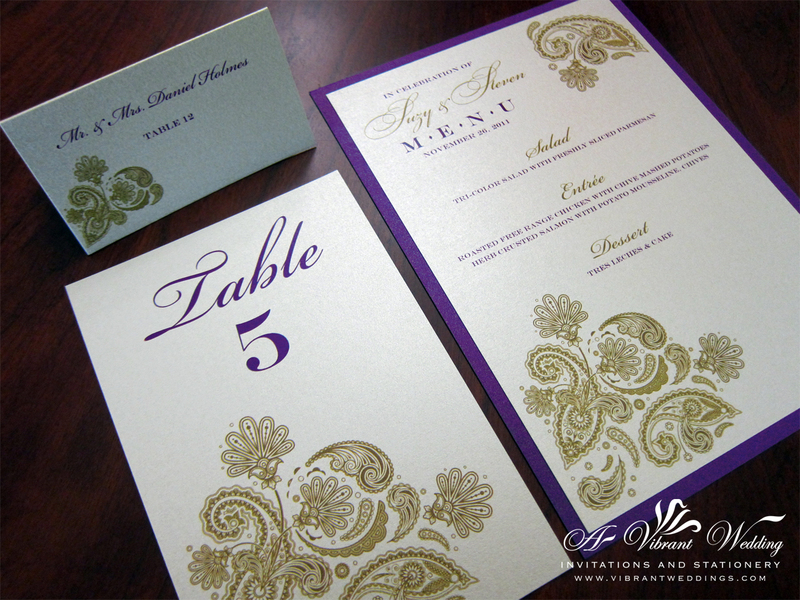 Double-layered on the inside with metallic-ruby purple and printed on matte-ivory paper. To view our extensive portfolio or to customize your own, please contact us at http://www.VibrantWeddings.com, avibrantwedding@gmail.com or (619) 852-6886. 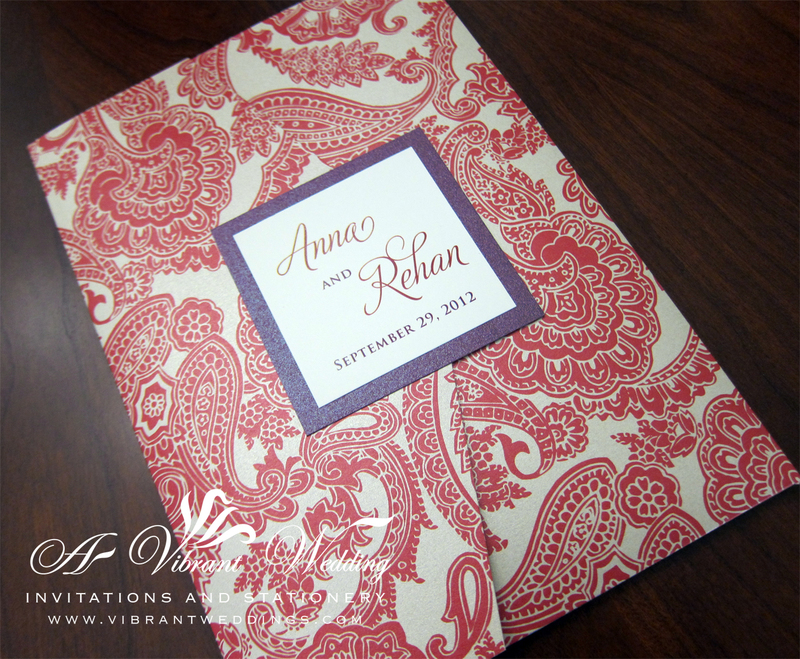 Includes 5X7″ Pocket-fold invitation in thes Red-Paisley-printed pattern, a Double-layered printed outer seal, Double-layered invitation on the inside, a flat RSVP card and two blank champagne metallic envelopes. Invitation printed on ivory matte card-stock. 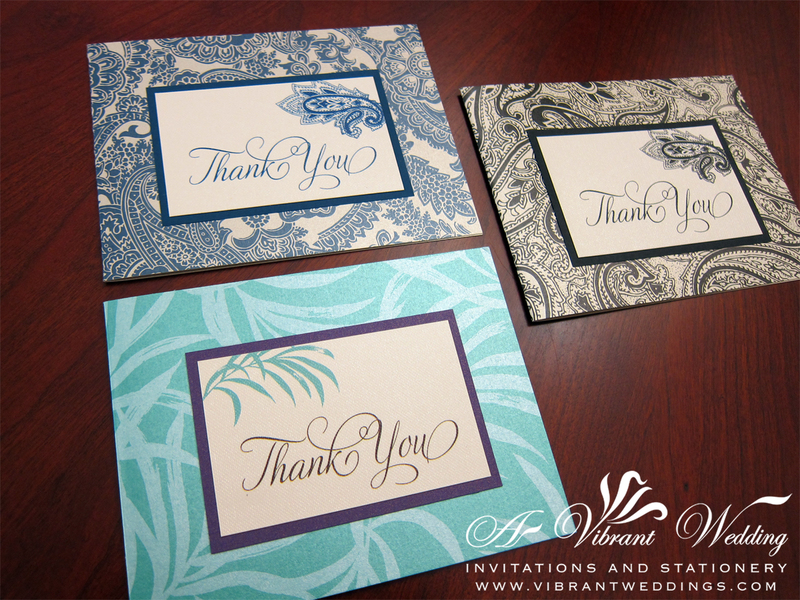 Customize your Thank You Cards to match your colors and theme for your special event. 5×7″ Double-layered Bridal Shower invitation with Rhinestones. 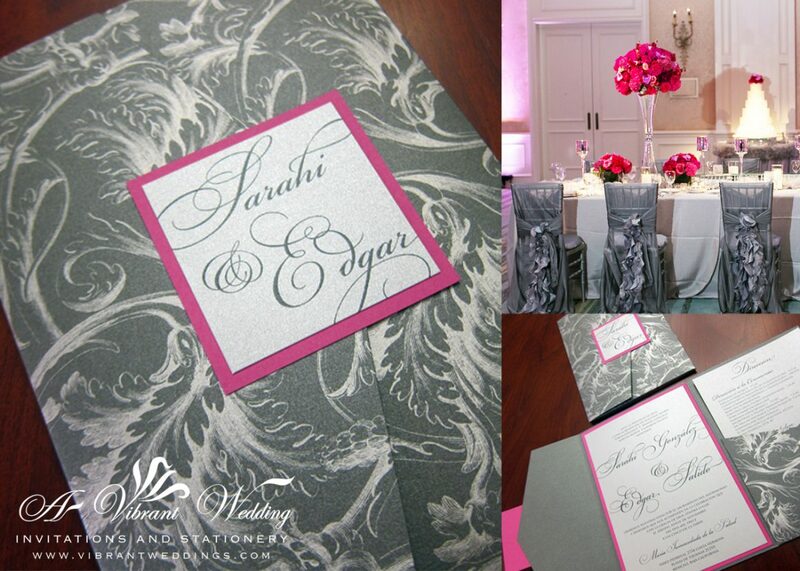 Customize your invitation to match your colors and theme for your special event. 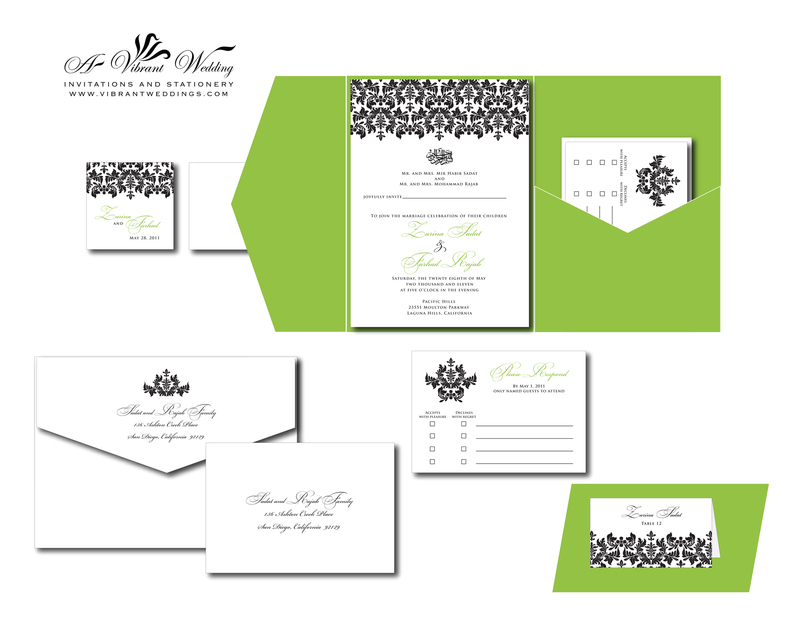 Includes Pocketfold invitation, the Response card and two blank matte envelopes (Green or White). 5×7″ Apple Green metallic Pocket fold with outer seal, printed on matte white card-stock paper. Double layered invitation (two sheets of card stock paper assembled together). Really great service! Super friendly and attentive. They will make any vision you have come true at a great price! $4.00 per invitation suite for a set of 100 invitations. 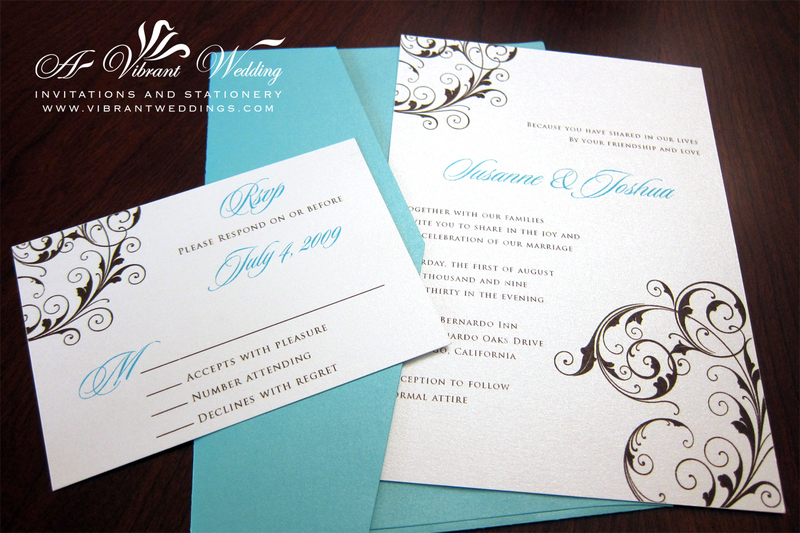 Included are 5×7″ white metallic card stock invitation, a 3.5×5″ RSVP card and two blank tiffany blue metallic envelopes. Upgrade this simple invitation by requesting an additional matted backing or trif-fold style invitation.